Almost all the curvaceous body panels on the Solstice are produced via sheet metal hydroforming – a first for a production vehicle. A relatively new process which uses water pressure to help form the desired panel shapes, sheet metal hydroforming is used to create the Solstice’s unique clamshell hood, outer door panels, rear deck lid and quarter panels. Sheet metal hydroforming of exterior body panels has seen limited use in other markets around the world, but predominantly for small runs of specialty aftermarket panels. Solstice’s body panels represent the first exterior application of the technology, which enables the transfer of original concept vehicle design without compromises, in a mass-produced automobile. More precise than conventional body panel stamping, sheet metal hydroforming (also known as hydromechanical deep drawing) allows the much deeper draw – or depth of the component – necessary for creating panels with complex curves. The process allows the body curves of the original Solstice concept to be reproduced on a mass production scale. Many of the Solstice body panels, in fact, such as the unique clamshell hood and its compound curves, could not have been formed by conventional stamping methods. The only conventionally stamped portion of the Solstice exterior is a small, almost flat panel between the front wheel well and door edge. Although more time-consuming than conventional draw stamping, sheet metal hydroforming offers reduced tooling costs, as only a single “positive” die is required for each panel. In the conventional stamping process, both “positive” and “negative” dies are required to form a single panel. The sheet metal hydroforming process uses hydraulic counterpressure to press a blank panel onto the die. Counterpressure builds as the die presses the blank downward into the water tank. The compressed water forces the blank onto the die, forming the shape of the panel. Because pressure is spread more evenly onto the blank, sheet metal hydroforming offers the additional advantages of excellent finish quality, uniform panel thickness and precise dimensional accuracy when compared with conventional draw stamping. More uniform panel thickness improves the chances for successful forming, particularly when creating complex shapes, such as the Solstice’s clamshell hood. 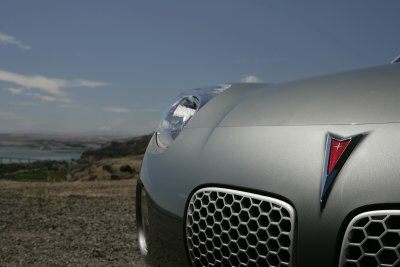 Achievement of the Solstice’s curvaceous contours was aided by hydroforming in other ways. The strength of the lower-dominant foundation of the vehicle’s hydroformed chassis freed engineers from having to use body panels as structural members, thus eliminating restrictions to applying the concept vehicle design to the production model.